Turn light, lie back, close your eyes... and enjoy the music ! "Rhapsody of Enchanted Lands" Reviewed by RadioIndy.com! The electro-ambient creations of "Rhapsody of Enchanted Lands" by Akuna Art are among the few out there that can bring two genres, electronic and ambient, together extremely well. One can sit back and relax at home and let the melodies of the tracks soothe you or bob your head while driving on a nice sunny day. The rhythm and melody work so perfectly; making this a unique, enjoyable album. The very last track "5 O'Clock AM" is beautiful soundscape with trumpets, synthesizers, and other more modern effects that will take the listener into another world. "Philosophy In the Bedroom" utilizes the cool tempo of tribal drums with synthetic effects which definitely give the album a unique tone overall. 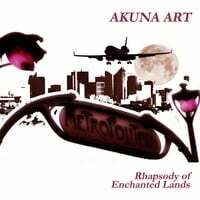 If you like Cafe del Mar with a little Enya, then this album, "Rhapsody of Enchanted Lands" by Akuna Art is for you. RadioIndy is pleased to announced that we have published our CD Review of AKUNA ART music to CD Baby. FANS - Please checkout AKUNA ART online! FANS - Please checkout AKUNA ART page and sample / purchase some great new music! FANS - Please checkout AKUNA ART iTunes page play / purchase some great new music! Radioindy has published AKUNA ART CD Review to lala Music Online. FANS - Please checkout AKUNA ART la la and play / purchase some great new music!